Over 3,000 American have been killed protecting fuel convoys, so the Pentagon has a strategy to get serious about efficiency. Watch one soldier go solar. NEW YORK (CNNMoney) -- Thousands of combat deaths and rising fuel prices helped push the military to outline a broad energy strategy Tuesday aimed at moving away from fossil fuels. 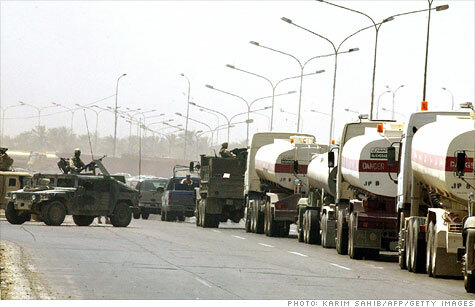 Over 3,000 American soldiers or contractors were killed in fuel supply convoys between 2003 and 2007 in Iraq and Afghanistan, officials said. Eighty percent of all supply trucks operating in the region are carrying fuel. "Our ability to sustain military operations is increasingly threatened," Deputy Secretary of Defense William Lynn said at a Pentagon briefing unveiling the new strategy. "Our adversaries are increasingly employing asymmetric tactics, and energy can be a soft target." Lynn said the pentagon spends some $15 billion a year on energy, up over 200% from a decade ago. Measuring the amount of energy used by each service branch and finding out exactly where it goes. Developing aircraft, ships and vehicles with lighter materials. Factoring energy use as a key component when making strategic decisions. And devising a plan to diversify energy sources away from fossil fuels. The military already has several pilot programs underway, testing various forms of renewable energy. The Marines recently outfitted a combat unit in Afghanistan with portable solar panels to recharge their radio and computer equipment -- eliminating the need for fuel deliveries that previously powered electric generators. The Army is developing hybrid trucks, and the Air Force has been running biofuels in planes for years. The new energy strategy, mandated by law, is designed to coordinate all these efforts and make it official Pentagon policy. Anecdotal evidence suggests military and former military members have a keen interest in renewable energy technology. Wind turbine builders have told CNNMoney that militaries the world over go to great lengths to accommodate the turbines near bases, even though they have a tendency to interfere with radar. One Army medic returning from Iraq recently switched his home to solar power. He said the amount of fuel he saw the U.S. military consume in Iraq -- and the suspicion that at least some of that money was finding its way into enemy hands -- was a driving factor. Renewable energy boosters hope that military contracts can provide a stable market for their wares, helping foster investments that drive innovation and ultimately lower the price until the technologies are cost competitive on the open market. They cite other technologies, notably the Internet, that the military first developed. It's a role Lynne suggested the military doesn't mind playing. "We can be an innovator, an early adopter of technologies that ultimately might have broader commercial use," he said.